Thanks to my new friend Joanna I was able to meet other skateboarders she knew in the Philly area. Her friend Mike gave me the heads up for Skate Jawn’s 4 year Anniversary Skate Jam. Like some of you reading this, I was unaware of what Skate Jawn was or what it meant. Skate Jawn is an independent magazine from Philadelphia. I highly recommend checking out their stuff. 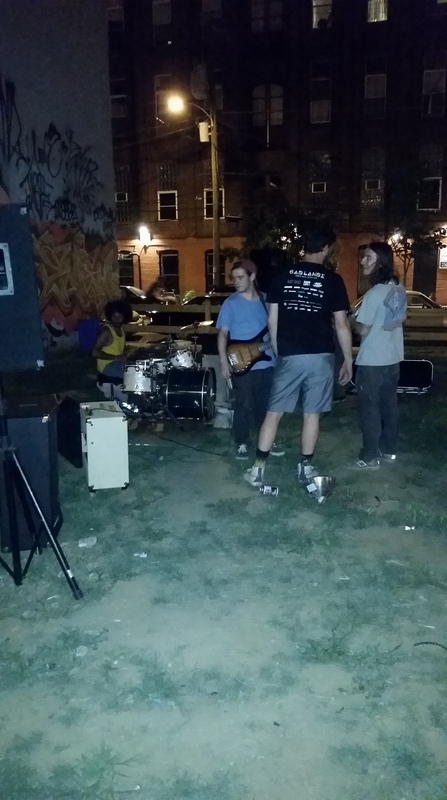 The skate jam was being held only 4 blocks away from Temple. Now one of the best things about skateboarding on the East Coast has been the ability to skate through the streets, dodging cars. It’s one of the funnest things on earth. Skateboarding in Oklahoma can’t really compete. The set up was fun. It reminded me of my childhood/hometown skate shop Dark Side Skates (rip). A street was blocked off with (unauthorized) police caution tape* and was decorated with a couple of ramps, boxes, manual pads, and even a handicap bump. Inside of the Skate Jawn building were DIY quarter pipes. Fun stuff. *A cop showed up about 30 minutes into the event. He played it cool and just asked for the tape to be removed at 7:00pm. Philadelphia Police Department give that man a raise. The vibes were great. Music blared out of speakers, people drank beers on the side, and burgers were constantly being grilled and given to anyone who wanted one. Then out of nowhere comes East Coast heavy hitter of Slap’s 2010 One in a Million fame Nik Stain*. Flat-out, the dude rips. Skates fast on every trick, slams hard, and has fun the entire time. The guy would go full speed on tricks like back 180 fakie manuals. Some of the slams I saw him take in the few hours I was there would end anybody’s session instantly. But swell-bow and all, he kept ripping. Also, I saw him do the sickest switch manual I have ever seen. The switch manual involved switch olleing up a curb backside, carving around a tree, and speed-wobbles. Followed by the hardest slam possible while doing manual. That one trick/slam got every person on the at the event hyped. Be sure to check out his part from Kevin Winter’s Bruns. *Don’t ask him about One in a Million. No matter how badly you want to ask him about Forrest Edwards and everything that happened on the trip, DON’T ask him. Luckily East Coast filmer Kevin Winters gave me this advice before I embarrassed myself. As if not seeing Nik Stain skate in person was awesome enough, the current Skater of the Year himself showed up with Philly legend Ed Duff. Yup, Ishod Wair. I was completely caught off guard. He showed up and gave knucks to everybody there, including me. I’m sure I looked like a dipshit as I stared back at him blank faced and gave him the world’s softest dap. But wow. Seeing Ishod skate in person was mesmerizing. I’m convinced he can do any trick he wants at any time. He basically did every trick first try. Easily one of the funnest people to watch skate, both in person and on video. The rest of the day/night I spent making embarrassing five minute conversations with anybody willing to chat. I mostly talked about how I was from Oklahoma and how I was in awe about seeing all the famous skate spots and skating in Philly in general. Boring stuff. But I did meet a nice woman named Bridgette who gave me some info on the beer deals nearby. Thanks Bridgette. I ended up bailing before the bands got into their sets but it was all for the best. Here’s a video by Kevin Winters including some footage from the skate jam. Support Skate Jawn. It’s ran by some friendly people who have the best intentions for skateboarding in Philly.